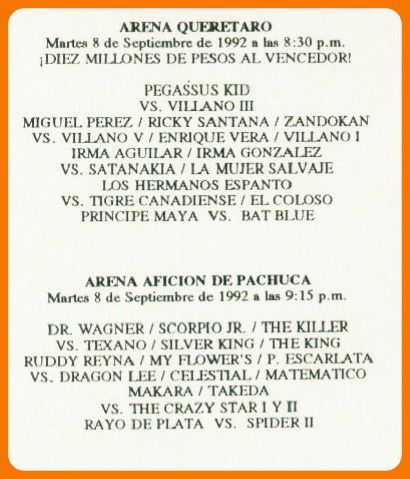 1) Pavorreal vs Soberbio Jr.
2) Dragón Lee & Gran Apache vs Apolo De Oro & Bucanero Jr.
4) Enrique Vera & Pegasus Kid vs Loco Zandokan & Miguel Perez Jr.
2) Crazy Star I & Crazy Star II vs Kahoz & Scorpió Sr.
1) Dragón Lee & El Vagabundo vs Apolo De Oro & Scorpió Sr.
4) Canek, Dr. Wagner Jr., Loco Zandokan vs Miguel Perez Jr., Ricky Santana, Scorpió Jr.
Blue King listed in two matches? 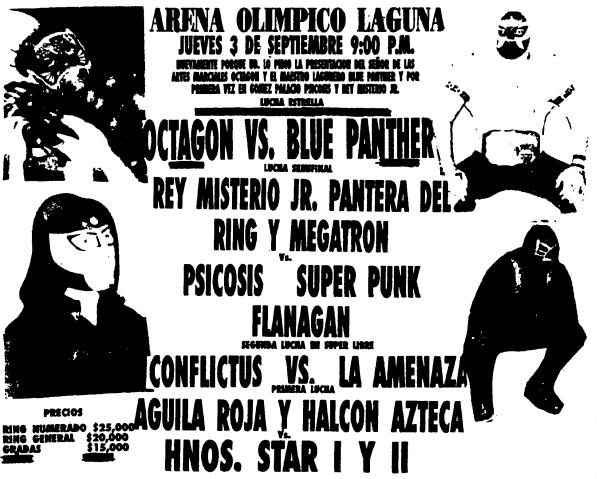 Black Power II was reported to be Signo/Navarro's partner, but was actually in Japan at the time. Three bbloody falls. Silver & Texano are teasing a rudo turn. 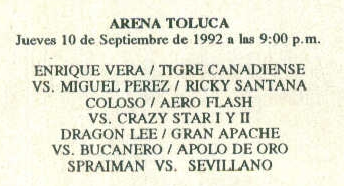 Villano III pinned Silver King, with apuesta challenges after. 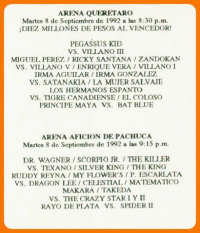 Villano III also challenged Pegasus Kid to a title match. 24:00. 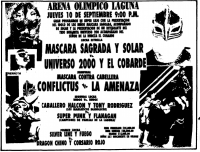 Vera missed a top rope knee drop, Canek put him in a figure four, Vera passed out due to the pain and was pinned. 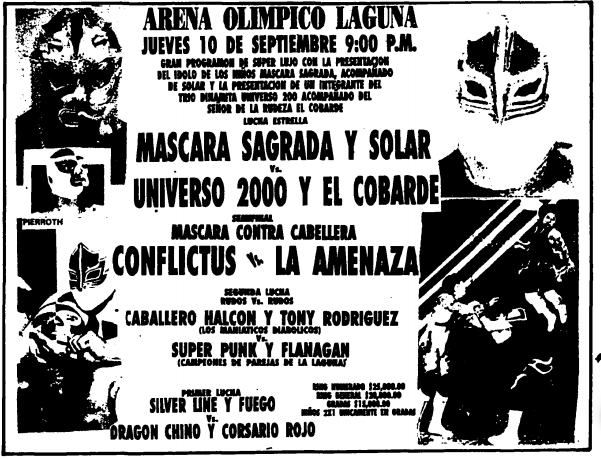 magazine Titanes del Ring said Mascara yanked Fantasma's mask for the DQ. 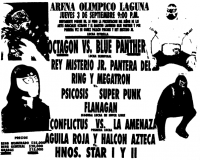 He put it back on, rudo fans rushed him and took the mask back off, and Konnan went after the fans (who were either kids or early 20s, depending on who you believe). 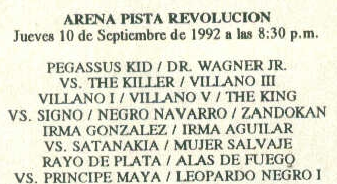 Cien Caras pulled Konnan back to the ring. 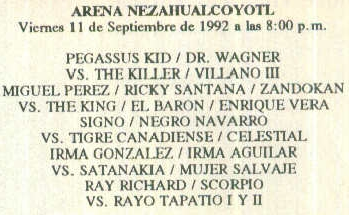 1) Rayo Tapatío I & Rayo Tapatío II vs Ray Richard & Scorpió Sr.
Pegasus Kid unmasked Villano III and Tiger Canadiense fouled PegasusKid for the DQ.